Workers in the world capital of electronics manufacturing have started a patent-free technology insurgency. Forty years ago, the Chinese city of Shenzhen was nothing but a sleepy fishing village across the border from Hong Kong. But, in the decades between then and now, it has become a factory town. 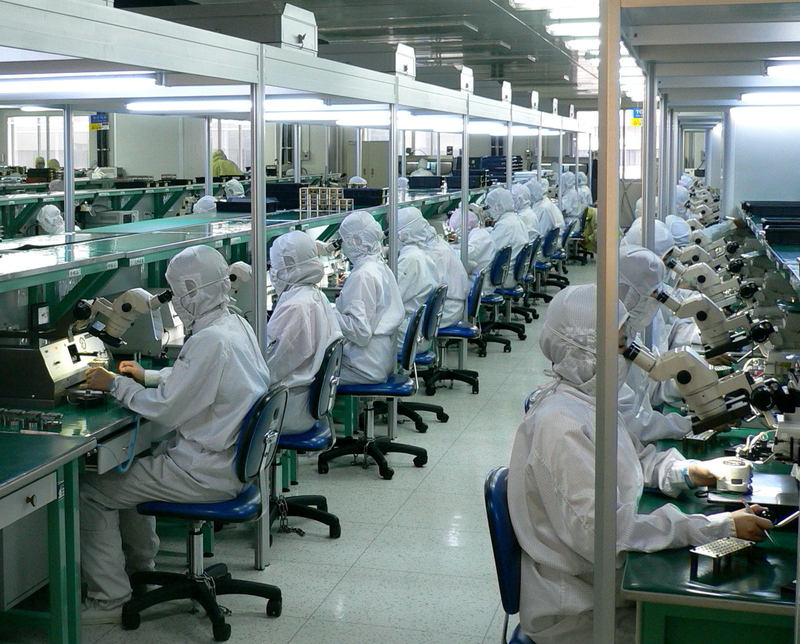 Today, Shenzhen produces 90% of the world’s electronics. To keep up with ever-increasing global demand, an endless procession of circuit boards, processor chips, and memory sticks are churned out by toxic factories with suicide nets. Silicon Valley may be in California, but the silicon itself is in southeast China. And there is a silver lining to the clouds of smog that cover the city. After 14-hour shifts, factory workers are putting their unrivalled knowledge of computer hardware to creative use. A maker movement is galvanizing electrical engineers (and inspiring game makers) who, a few years ago, might have spent their free time on intellectual property theft. Today, the tinkerers of Shenzhen create new products instead of off-brand PlayStations, though they still do that sometimes as well. Like hacker culture, the maker movement is a subculture of dreamers and inventors. The community revels in disassembling electronics, studying their inner-workings and then repurposing devices, mostly just for fun. And, while there are makers all over the world, nowhere are they as adept and fanatical about reverse engineering gadgets than in Shenzhen. “Shenzhen gets to act fast because of its open and collaborative ecosystem,” says David Li, co-founder of XinCheJian, the first makerspace in China. In addition to establishing makerspaces, Li is a key figure in the Shenzhen tech scene having established a research hub and accelerator program, which is backed by Intel and Shenzhen Open Innovation Lab. Thousands of workers in a Shenzhen factory assemble and test fiber optic systems. This copycat culture, known as Shanzhai, has been celebrated by locals as being the driving force behind Shenzhen’s culture of innovation. The term, which literally translates as “mountain stronghold,” refers to the radical thinking of bandits operating far away from central authorities. In this case the central authorities are copyright and patent enforcers who would clamp down on the blatant infringements were they happening elsewhere. “Shanzhai will likely play an even more important role as the maker movement emerges globally, sharing a similar open and collaborative culture that is counter to the proprietary nature of current global development practices,“ Li adds. Research has shown that patents often stifle innovation by establishing monopolies. In China, being able to rapidly copy, rip-off and improve other people’s designs without state interference has created opportunities to mod existing devices for more culturally specific needs. Tech evolves in Shenzhen in a way that is doesn’t in any American city. Playstation controllers don't make themselves. China has largely turned a blind eye on these infringements, because the intellectual property has almost always been owned by its rivals (specifically Japan, South Korea, and the U.S.). Ripping off intellectual property from those countries was a win-win for China. But the Chinese government no longer wants to be the world’s sweatshop. There are more middle class consumers in China than there are in America now, and their economy is shifting from manufacturing to consuming. To fund this transformation, the Chinese Communist Party realises that they have to produce their own, world-leading products to sell. And so they’re piling huge amounts of money into research and development hoping that the futures next Apple or Google will be a Chinese company. If China becomes dominated by intellectual property-rich companies, then they’re going to have to clamp down on intellectual property infringement. 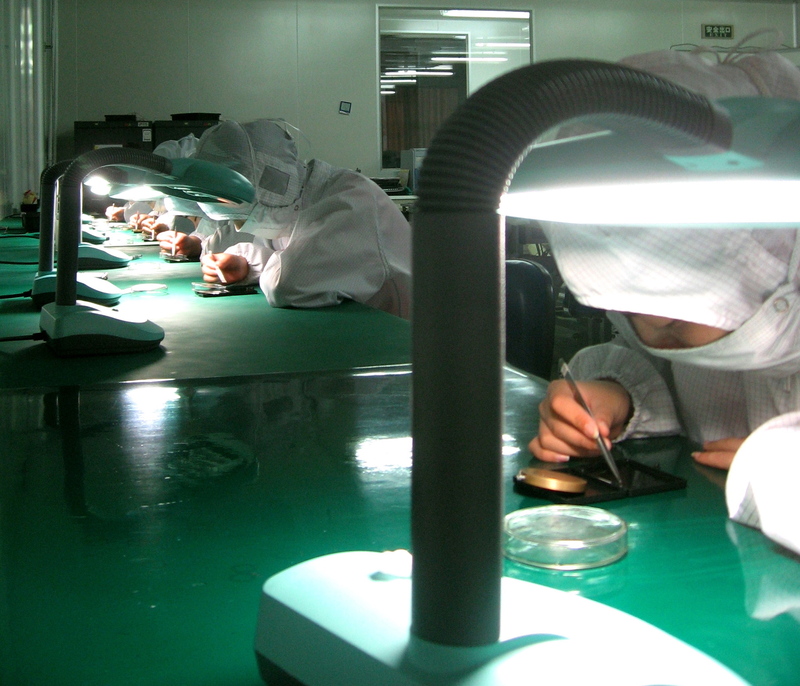 Optoelectronic devices smaller than a pixel are inspected by workers on 12-hour shifts. The future of Shenzhen very much depends on how the Chinese government decides to handle this. Come down too hard, too soon on intellectual property infringement and they could stifle the culture responsible for the citys success. Turn a blind eye and rampant piracy could prevent Chinese startups from ever becoming global players because their ideas are instantly cannibalised by other startups. But whatever happens, the maker movement seems like it’s only just getting started.